Blog Magento - Android app for Embedded ERP is released ! 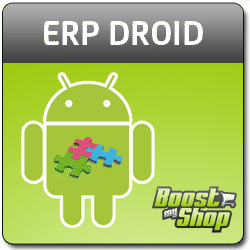 Android app for Embedded ERP is released ! Embedded ERP provides every features to handle logistic within Magento : although Embedded ERP supports usb barcode scanner, using a laptop in a warehouse to pick / pack orders, or receive vendor merchandise is not very handy. To provide a professional and convenient way to handle logistic, boostmyshop team has released ErpDroid, an android based application that supports barcode scanner and communicate with your magento server to create purchase order deliveries, update inventory and dispatch orders.